Saturday, 7th April saw the conclusion of World ARC 2017-18 back where it all began in Saint Lucia with jubilant crews celebrating the achievement of sailing around the world. The day was bitter-sweet for the rally crews who have become 'like family', sailing in company to beautiful, fascinating and welcoming places as part of the ultimate 'bucket-list' experience. With memories to last a lifetime, this diverse group of circumnavigators are right to be proud of sailing the world's oceans and completing the dream together. The Parade of Sail and a special end of rally dinner provided a fitting finish to the adventure. Excitement swept through the docks of Capella Marina in Marigot Bay as each crew prepared for the ceremonial last leg to cross the line in Rodney Bay. It would be a special moment for all fourteen yachts to complete a circumnavigation from Saint Lucia to Saint Lucia, eleven of whom had started in January 2017, whilst three had left a year earlier and took a break on reaching Australia before re-joining. Over the past 26,000nm sailing the world's oceans, an incredible camaraderie has developed between the crews with helping hands never far away. Sailing together as a fleet, crew have shared knowledge, supplies and skills and, whilst completing the circumnavigation is an amazing personal achievement, completing it together significantly added to the poignancy of the finale of World ARC 2017-18. 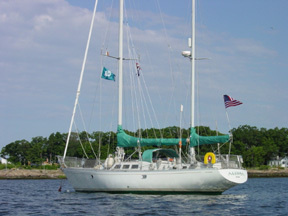 Even on the final passage when a mooring buoy rope got caught around the propeller of American yacht Aurora threatened to delay the departure of the Parade of Sail, the quick actions of skipper Ken, and fellow participant Thomas from Hanna, who both dove to clear the rope, quickly resolved the issue and saw the boat on their way. 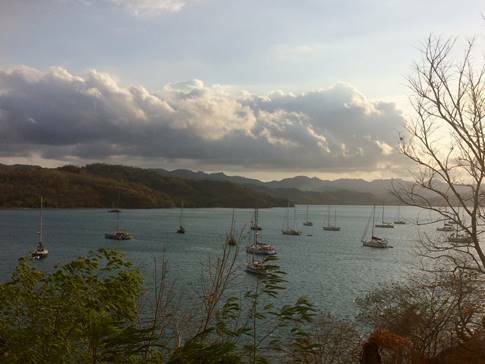 Leaving Capella Marina behind, the flotilla of yachts, each dressed overall, formed a line to follow the coast of Saint Lucia to IGY Rodney Bay Marina. 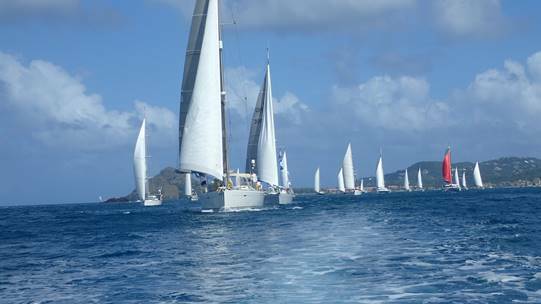 Motoryacht Breeze Away with owner Bernard Johnson aboard escorted the fleet from Marigot Bay, through Castries Harbour, where she acted as a turning mark, before the final stretch to the finish line in Rodney Bay. A number of local dignitaries were on board to show their support for the fleet including the Honourable Dominic Fedee, Minister of Tourism, Information and Broadcasting, Agnes Frances, Director of Saint Lucia Tourism Authority, Sean Deveaux, General Manager IGY Rodney Bay Marina, Tessa Joseph from Events Company Saint Lucia, and Andrew Bishop, Managing Director of World Cruising Club. As one participant likened his fellow crews to a 'second family', Saint Lucia holds the significance of a 'second home' for crews on their return. "Being the only place on the route of World ARC that the fleet visit twice the arrival back into familiar surroundings is always enjoyed by participants, who reflect on how much for them has changed having completed the challenge of a circumnavigation." Remarked World Cruising's Managing Director Andrew Bishop, "For them it feels like coming home, after what has been an adventure of a lifetime, with a tinge of sadness as it marks the beginnings of a new chapter of their lives as they start to head home in different directions. The rendezvous at Marigot Bay, and the Parade of Sail to Rodney Bay, are a special way to end what has been a great trip together for sixteen months." Reflecting on how it feels to complete a circumnavigation, Louise Wennberg from the family boat Take Off admitted that, "The world has definitely become a smaller place!" Sailing with young children Alex and Inez, the Swedish family began the rally in 2015 sailing to Australia before taking a year out to return to Europe for the children's schooling. "I feel so fulfilled, and that it will be easier to face future challenges. Our time with World ARC has been a tremendous experience; no words can fully describe it." The final dinner of World ARC 2017-18 was held at the Royal by Rex Hotel in Rodney Bay, where the participants were greeted with steel pan music and rum punch, before sitting down for a delicious dinner, interspersed with welcome speeches from Dominic Fedee, Minister of Tourism, Information and Broadcasting, and Andrew Bishop, Managing Director of World Cruising Club. The grand finale was an entertaining recount of happenings over the past six months of the second half of the rally, and a short story about each boat before they came forward to receive their World ARC plaque, certificates for circumnavigators, and an evocative commemorative photo book full of memories from their adventure. "The end of the rally is a happy and sad moment," said Ken Swan from Hylas 51 Aurora. He sailed the full circumnavigation with wife Eileen over the course of 16 months, joined by friends and family along the way. "We will be sad to see folks go their separate ways, but happy of the achievement of the circumnavigation. It's been a dream since I have been 12, and now it's checked off my bucket list!" Indeed the knowledge of achieving the dream is what all the World ARC adventures will take with them on their next sailing endeavours. Future plans are as varied as the number of boats, with some set to be sold, and others sailing back to be based in home ports far and wide from Annapolis to Stockholm. Others are not done with ocean sailing just yet and will be heading to the Mediterranean, and a few will stay for a season in the Caribbean. Wanderlust is not over for everyone, and one yacht intends head back into the Pacific with World ARC 2019-20 to Australia before completing a circuit of the north Pacific, and returning to Europe via Cape Horn. As the curtain falls on another hugely successful World ARC rally, the stories of these sailors as they go their separate ways will be set to inspire many more future circumnavigators. World ARC has starts from Saint Lucia (January) and Australia (September) each year, with a multi-national fleet sailing the world's oceans and achieving the dream in company. Cruising sailors looking to fulfil the ultimate bucket-list dream are encouraged to start planning now for their own adventure, with a wealth of advice available from rally experts World Cruising Club.